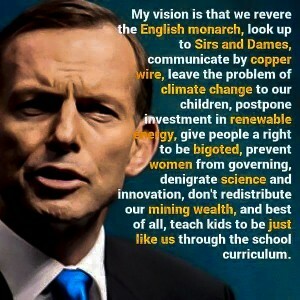 Upset by Knighthoods but nothing else? We the people of Australia elected Tony Abbott to be our chosen and democratically elected leader because we trusted him with the role of representing both us to the world and the ideology we would be guided by! ….. <sigh> …..Perhaps next time we’ll take seriously politics instead of having some perverse pride in being “Aussie” and apolitical. Instead, guided by three word slogans, family influences, uninformed opinions, Murdocks papers (despite many of you being acutely aware of his bias) many made the decision with as much thought you give to what you’re going to have for dinner. Almost unbelievably, surveys have shown many voters make up their mind on the day of voting. Many folk, like far too many Australians, feel you shouldn’t get involved in politics or make a stand for a more egalitarian society. The perception of a need to be “apolitical” dominates our thinking like a slow acting Cancer. By the time you realise the disease needs to be acted on, it has eaten away most of you leaving you wasted and without resource to fight. But after this Australia Day we have found some energy. What is interesting in the energy of reactions to disrupting our education, health, climate response, taxation, treatment of the poor & refugees, electricity prices, Welfare, regulation, expert advisory panels, transport and science funding, industrial relations, employment and etc have not matched that generated by giving a foreigner a knighthood. This act of knighting a Prince is what get’s up our goat. It’s all too hard to think about, isn’t it! So what’s for dinner? So what is disturbing is the suggestion that 3 marginal seats have shown little reactions to disrupting our education, health, climate response, taxation, treatment of the poor & refugees, electricity prices, Welfare, regulation, expert advisory panels, transport and science funding, industrial relations, employment and etc but may, in fact, be disturbed by Abbott giving a foreigner a knighthood? Am I the only one that finds that a completely out of proportion reaction? Is it something so bloody inconsequential to Australian’s lifestyle and ethics, that is likely to turn people around?